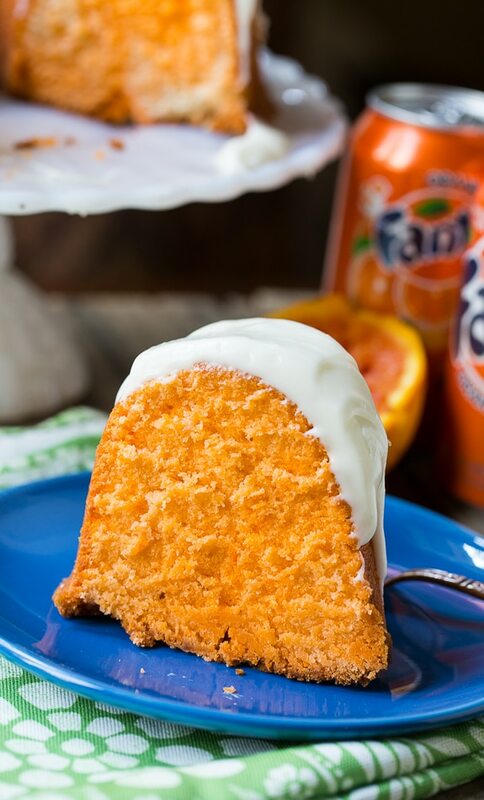 Fanta Pound Cake has a fabulous texture as every good pound cake should, a slight orange flavor, and a thick cream cheese icing. It’s basically a pound cake with a little orange flavoring from Fanta soda and some orange zest. But we know a plain pound cake can be one of the most awesome desserts right? And this one is totally decked out for summer a bright orange color. There are certain sodas I only drink during the summer. There’s something about an ice-cold Cheerwine or Fanta Orange on a hot summer day. Your energy starts to wane due to the oppressive heat and then a couple of gulps of Fanta Orange, laden with sugar, can give you enough of a boost to refrain from taking a nap. A combination of butter and shortening plus a packet of whipped topping mix gives this cake an incredible texture. So rich and buttery and dense, but tender. It’s almost velvety. Gotta love the orange color! It’s almost Clemson Orange. Note: You’ll have to add orange food coloring to get it this color. To get the best texture, beat the butter and shortening a long time, very slowly beat in the sugar, and beat in each egg before adding the next one. But then, you want to mix as little as possible. Just enough to get an even consistency. 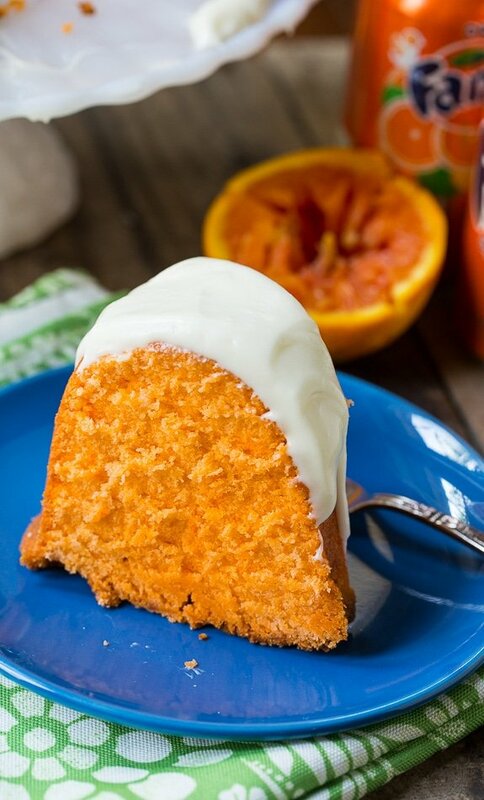 Fanta Pound Cake has an incredibly rich, buttery, and tender texture and a slight orange flavor from Fanta soda and orange zest. Preheat oven to 325 degrees. Grease and flour a tube pan. Cream butter and shortening for 3-5 minutes using an electric mixer with a paddle attachment (or a hand mixer). Gradually add sugar. Add eggs one at a time, stopping to scrape down sides of bowl. 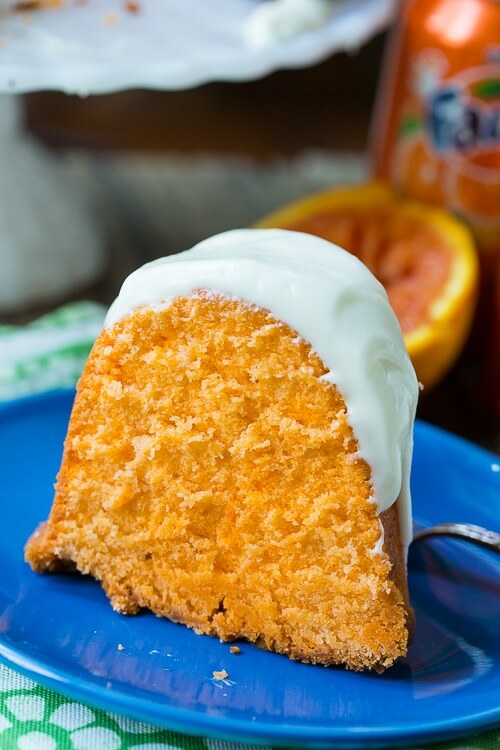 Alternate between adding flour and Fanta, beginning and ending with flour. Beat in vanilla extract, orange zest, salt, and whipped topping mix. If desired, add food coloring to get a deeper orange color. Pour batter into pan and bake for approximately 1 hour and 15 minutes. Let cool in pan for 15 to 20 minutes and then invert onto a cake stand. To make Icing, beat butter and shortening together until smooth. Add orange juice. Gradually beat in confectioners' sugar and milk. If too thick, add a little more milk or orange juice. Spread icing on top of the cake and let it spread down the sides some. You want to beat the butter and shortening together really well before adding sugar and then continue to beat until fluffy and very light in color. Once eggs are added, beat as little as possible. Not sure what whipped topping mix is? Here is a link to Dream Whip Whipped Topping Mix on Amazon. You can get a much better price on it at your grocery store. Look for it by the pudding mixes on the baking aisle. It usually seems to be on the top shelf. 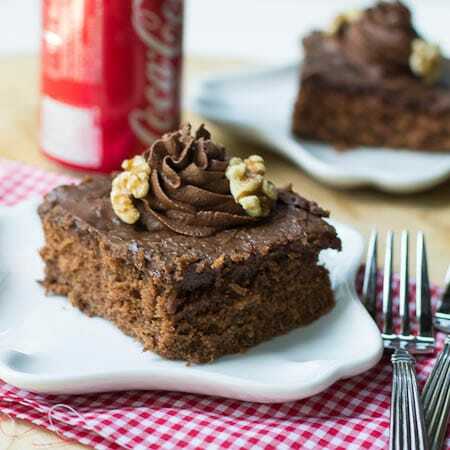 This entry was posted in Cakes, Desserts and tagged Fanta, pound cake, summer. Bookmark the permalink. Does it really need this much sugar or can I cut it back? I would really like to try this recipe. What can I use in place of the vegetable shortening? know what whipping topping mix is. Can I substitute it with something else please. or try just leaving it out. Cheerwine! 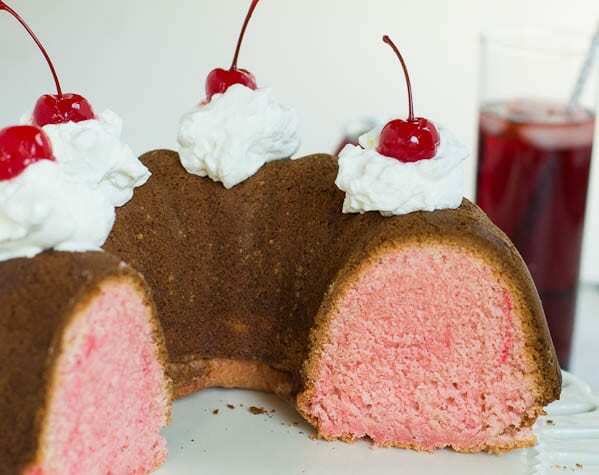 I’m so glad I read further down the blog, a Cheerwine Bundt Cake, what a dream! You always make the most incredible things! And this is gorgeous in color too. Winner! Pinned. How fun is this? It looks and sounds absolutely delicious! The color is absolutely amazing. It did take a way my heart beat. It’s like sunshine in a beach. So vivid and irresistible. I love the Fanta in this! So pretty for summer! Gorgeous cake ! Love the color! pinned! The pound cake looks so moist and delicious! I love the bright happy orange! 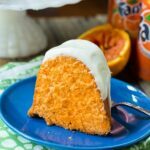 Adding Fanta is such a fun idea! OMG my kids would go crazy for this! Awesome! Oh I’m so impressed with this pound cake, Christin! Using fanta sounds like such a great idea! And I love the pretty orange color and flavor! Oh man, I have not add Fanta in ages! But this cake makes it seem more grown up, and the color? I LUHVE IT. What a fun recipe – pinned! When I hear Fanta, all I want to do is sing the song! Ha. Fanta, fanta, don’t you want a Fanta?? I would LOVE to see what it tastes like in a cake! Fanta pound cake – this is such a fun idea! Love the bright, happy color :).